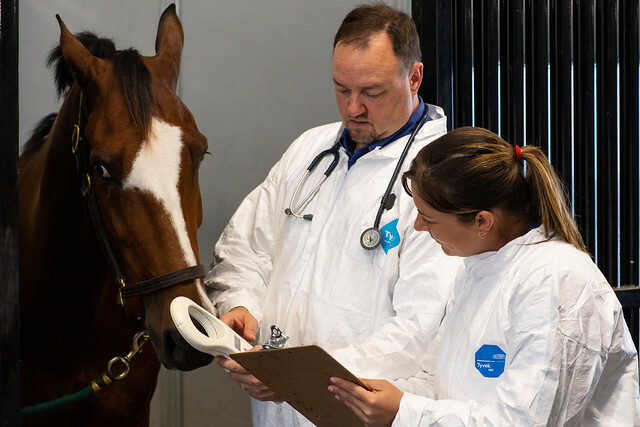 APHIS veterinarians check a horses’s identification against its paperwork during an import inspection. Ensuring the health of imported horses is critical to protecting the United States from foreign animal diseases. Everyone knows about the Olympics, but did you know that there’s an Olympics-of-sort just for equestrian sports? Every four years, the world’s best competitors in a variety of equine sport disciplines get together for a spectacular event that awards 30 gold medals over the course of 13 days. Beginning in mid-September, the World Equestrian Games will take place in Mill Spring, North Carolina at the Tryon International Equestrian Center. Officials estimate half a million spectators will attend this year’s competition. Around 1,000 horses representing 75 countries from around the globe are now starting to arrive at the Tryon facility for the Games. Of these, approximately 800 horses are international horses travelling here just to compete. But how exactly do you bring international horses safely into the country, while still protecting the health of the U.S. horse population? That’s what our staff at USDA’s Animal and Plant Health Inspection Service does – for the Games and every day of the year. It’s our job to protect the health of the nation’s livestock, including horses. Our veterinarians inspect every horse being imported into the country, whether they are here to stay or they are here for a couple weeks to compete. This ensures that international horses do not introduce any foreign animal diseases into the U.S.
We worked closely with the organizers of the Games, the Tryon facility and our state animal health officials to develop a temporary quarantine area on-site and for many of the horses to arrive at/depart from the nearby Greenville-Spartanburg airport. All told, there is a group of 50 animal health officials from USDA, North Carolina and South Carolina supporting the temporary quarantine process. They are on-site now and will remain until all of the international horses are safely on their flights home. To learn more about what happens as part of the horse import inspection and quarantine process, please visit the Protecting the Health of America’s Horses page. You can also view this video about our inspection and quarantine process. What a cool experience! I was able to watch some of the WEG on the Olympic Channel. I wish they showed more. The cross country course was well designed, it looked like. Thanks to you and all of our AC inspectors for ensuring the health and wellbeing of the many elite equine athletes. It was a big task. Kudos!